for breakfast on birthday mornings (Jane). This is my original recipe from my very first recipe book that I started when I was 12. It has been well used! 1. Beat oil, sugar and vanilla together. It's easy to mix these three ingredients. Using a spoon will do it. For years I used to cream 4 oz. of butter with the sugar but canola oil does the job and it's a lot quicker. 2. Add eggs and mix well. 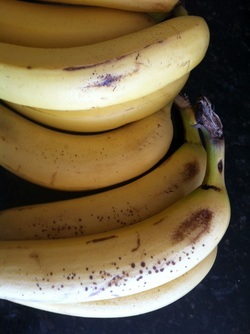 Add in thoroughly mashed bananas. 3. Fold in flour and baking powder and then fold in baking soda mixed with milk. Add nuts if using. 4. Prepare a cake tin by applying butter to pan, then flour and shake out excess. Line cake pan with greaseproof paper or parchment paper. 5. Bake in center of oven pre-heated to 350 degrees F and cook for about 50 minutes until tested with a toothpick that comes out clean. 6. 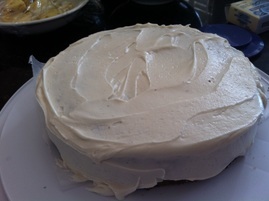 To make extra special add some cream cheese icing - 2 oz. butter, 2 oz. cream cheese softened - add about 2 1/2 cups of powdered sugar and a splash of vanilla. 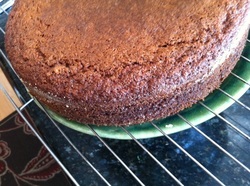 Beat well and smooth onto cooled cake! And end up with this. It won't last long so you might want to make two! The recipe doubles really well. Ready to eat with cream cheese icing!